Fits All 1999-2005 Dyna Models. This is a brand new Bolt On Spring Solo Seat Mounting Kit for the 1996-2005 Dyna Models! This listing is for the seat mounting kit only. This kit was designed and manufactured by us. And is currently only available through our stores. Now 1996-2005 Dyna owners can mount a spring solo seat to there bikes without modifications! This kit is is 100% bolt on, and all the parts are included for a spring solo seat mounting, except the seat. Seats can be purchase in my listings and my store. It comes with a super heavy duty chromoly steel hinge. The kit also includes springs and necessary mounting hardware. The kit is installed using the tank mounting bolt and a rear bolt. It is very easy to install. Seats are sold separately. Any of our seats will fit on this kit. The 15x14" tractor seats and the other larger seats like 11x14, 12x13 look the best on the Dyna kit. 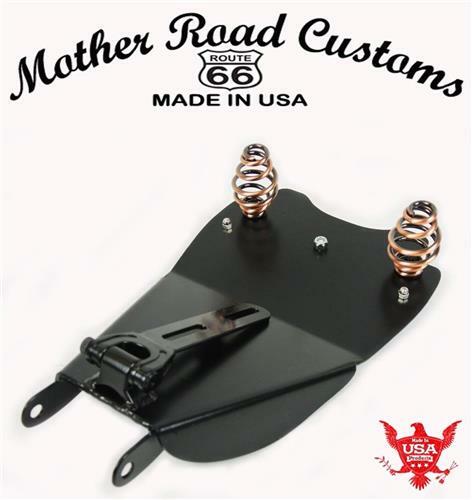 Thanks for shopping at Mother Road Customs.